‘One man's rubbish is another man's gold’ and Dan Phillips has proven that age old truism through his construction business Phoenix Commotion. A trained architect from Huntsville, Texas, Mr. Phillips helps people build their own affordable dream homes with recycled materials that most people would consider useless. Up until now, he has helped construct 14 houses, each of which have welcomed low-income, first-time buyers to the world of home ownership. When Dan Phillips was a child, he saw his parents suffer through the Great Depression years and he quickly learned to value what he had. When he was 14 years old he built a bicycle completely out of scrap materials collected at a nearby dumpsite. And after that first bike, he never looked back. To build these wonderful and enchanting homes — often made up of 75+% of recycled materials — Mr. Phillips and his builders use what is available to them locally. This ranges from scrap wood leftovers, mismatched bricks and tiles, bottle tops and corks, and even bones he’s collected from a nearby cattle yard. In fact, one of Huntsville’s houses, the Bone House, has a complete range of furniture made from cattle bones, like this customized quirky table and chairs that come with a spine. One of the most playful homes in the area has to be The Story Book House. Inspired by children’s stories that Mr. Phillips used to read as a kid, this Normandy-style home has a unique striped rooftop. The wooden door is decorated with colored bottle ends, acting as stained glass and welcoming visitors with a classy recycled style. When the Plant Environment needed an extra shelter, owner Clyde Lavelle commissioned Mr. Phillips to help him make a structure with recycled aluminum soft drink cans that were flattened and folded, making a recyclable and decorative façade. The roof of the License Plate House is entirely made from discarded plates collected from the Texas tax office, which like mirrors, reflect the sun’s radiant energy back into space, helping cool the house throughout the hot, arid summers. Inside the house a floor covered with hundreds of different colored bottle tops make use of creative reuse exposing a cute illustration of an animal. The first house built by Mr. Phillips is also probably the most gorgeous one. 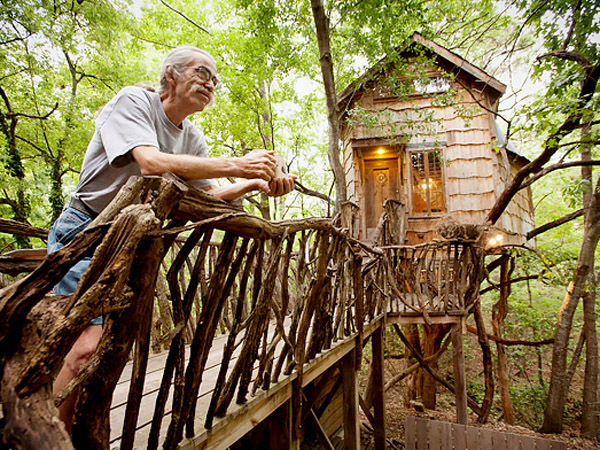 The Tree House is located thirty-five feet above the ground on top of a Bois d’arc tree and consists of a complete main house, a working art studio and a large patio area. The house also features a cork floor and is mainly built from scrap wood and tree branches. One of the most striking features of the Tree House, however, is the arty recycled frame ceiling salvaged from a shop that was getting rid of its old frame samples. In addition to amazing views to the lush treetops, the house features a shiny wall decoration made from broken mirrors that reflect the light coming in from the many circular windows of the house. Even though Phoenix Commotion is not a nonprofit, the building business gives Mr. Phillips enough money to live from what he enjoys doing. The houses are taking less time to build than before and Phillips plans to replicate the idea of recycling materials to make unique sustainable affordable houses. But his biggest reward is to give the less fortunate a home of their own. WE ARE TRYING TO FIND SOMEONE TO BUILD MRS JOHNSON A HOME IN HUNTSVILLE TEXAS WHERE HER HOME BURNED DOWN. SHE HAS HELPED MANY HOMELESS PEOPLES ..WE CALL IT THE HOME OF REFUSE BECAUSE SHE HAS RECUSED MANY HOMELESS WOMAN AND CHILDREN OUT OF THE WEATHER.SHE HAS MUCH FOR OUR COMMUNITY.PLEASE DO YOU KNOW ANYONE CAN HELP HER GET ON HER FEET.HELP HER TO REBUILD,NOW SHE IS LIVING FROM HOUSE TO HOUSE..she is a nonprofit [email protected]/she has helped so many peoples in walker area for many years now let us help her. Mr. Phillips, I have torn down my deck or most of it. I have all of the lumber which had been painted one top. It is 95% 2x6's and the rest is 2x4's. I would hate for it to go to waste. You are more than welcome to have it. I live down the street from you. I have a white metal roof. I am with the Roxie Douglas Learning Institute and we need help finishing the Institute for the Fall school year. I wish Mr. Phillips and his crew would take on the Institute as their next project! We are a 501c3 non-profit organization and all work done for us is tax-deductible. Name-Carmen Irving. My contact number is (936) 355-4833. Praying for help! I have seen Dan\'s homes! They are very creative and inspirational in their use of reclaimed materials. What a brilliant idea for servicing those in need. Really cool uses of available resources..very creative stuff! 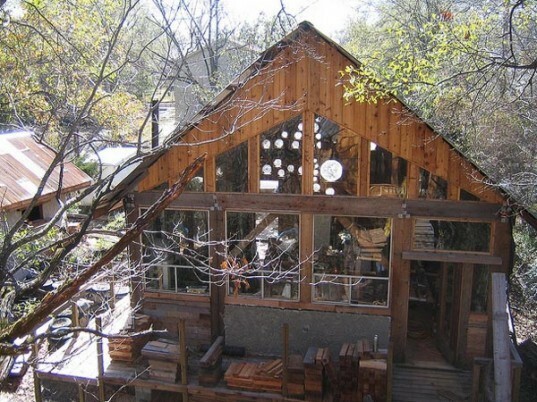 One of the happy home owners, helped build her own pad from recycled wood and other discarded materials. To build these wonderful and enchanting homes -- often made up of 75+% of recycled materials -- Mr. Phillips and his builders use what is available to them locally. This ranges from scrap wood leftovers, mismatched bricks and tiles, bottle tops and corks, to even bones he's collected from a nearby cattle yard. One of Huntsville’s houses, the Bone House, has a complete range of furniture made from cattle bones, like these customized quirky table and chairs that comes with a spine. 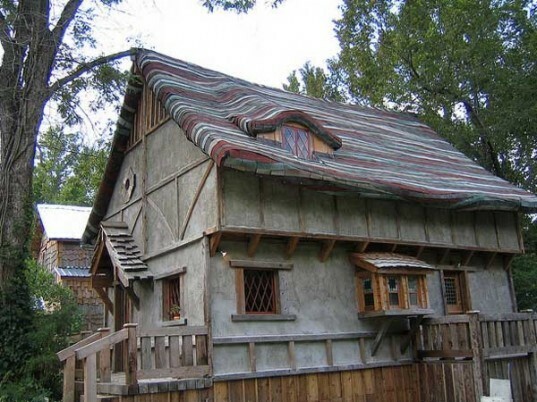 One of the most whimsical homes in the area has to be The Story Book House. Inspired by children’s stories that Mr. Phillips used to read as a kid, this Normandy-style home has a unique stripy rooftop. A rusty door handle has been given a second chance at one of the house´s doors. The wooden door is decorated with colored bottles’ ends, acting as stained glass and welcoming visitors with a classy recycled style. When the Plant Environment needed an extra shelter, owner Clyde Lavelle commissioned Mr. Phillips to help him make a structure with recycled aluminum soft drink cans that where flattened and folded, making a recyclable and decorative façade. The roof of the License Plate House is entirely made from discarded plates collected from the Texas tax office, which like mirrors, reflect the sun’s radiant energy back into space, helping cooling the house through out the hot arid summers. Inside the house a floor covered with hundreds of different colors bottles’ tops make use of creative reuse exposing a cute illustration of some kind of animal. The first house built by Mr. Phillips is also probably the most gorgeous one. The Tree House is located thirty-five feet above the ground on top of a Bois d’arc tree and consists of a complete main house, a working art studio and a large patio area. The house also features a cork floor and is mainly built from scrap wood and tree branches. 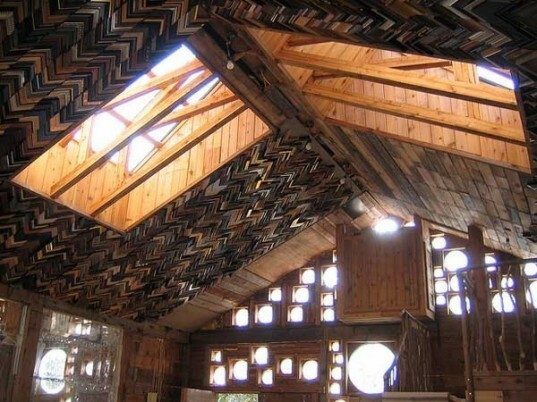 One of the most striking features of the Tree House, however, is the arty recycled frame ceiling salvaged from a shop that was getting rid of its old frame samples. As well as amazing views to the lush treetops, the house features a shiny wall decoration made from broken mirrors that reflect the light coming in from the many circular windows of the house.